Where are the best seats at Wimbledon - Centre Court? 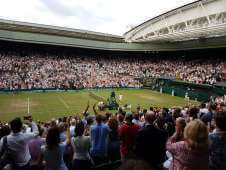 From the ratings submitted, Seat Blocks at Wimbledon - Centre Court have been given an average rating of 3.8 out of 5. This is how our site users rate the seat blocks at Wimbledon - Centre Court. Seat block 204 gets the best rating at Wimbledon - Centre Court. Click for more information. The AELTC endeavours to provide a high standard of accessible facilities for visitors and spectators with a disability, including those using a wheelchair. Rain doesn't stop play on Centre Court thanks to its moving rood. The roof weighs 1,000 tonnes and covers 5,200 square metres. The folding fabric concertina design is in two sections. The fabric is strong, flexible and translucent to help provide light and an airy feel. The height of the roof from the ground is 16 metres. 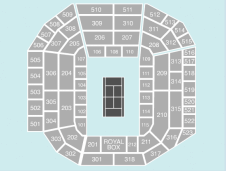 We currently do not have any events listed at Wimbledon - Centre Court, please click on a seating plan for more information about seat locations at Wimbledon - Centre Court.